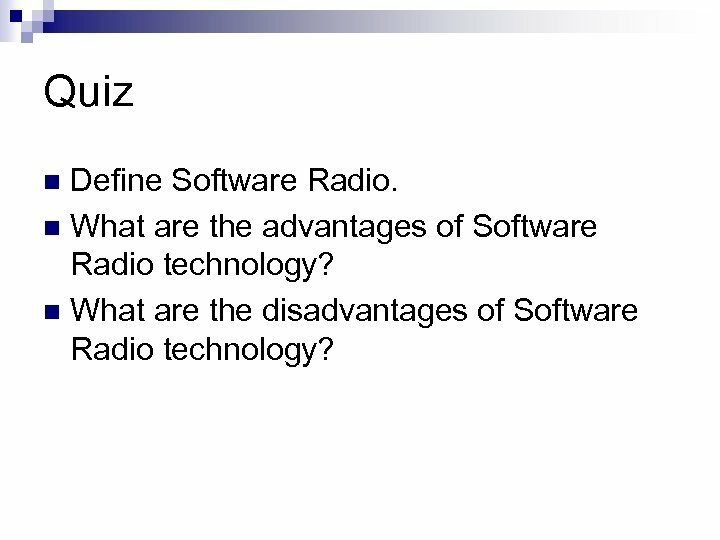 What is Software Radio? 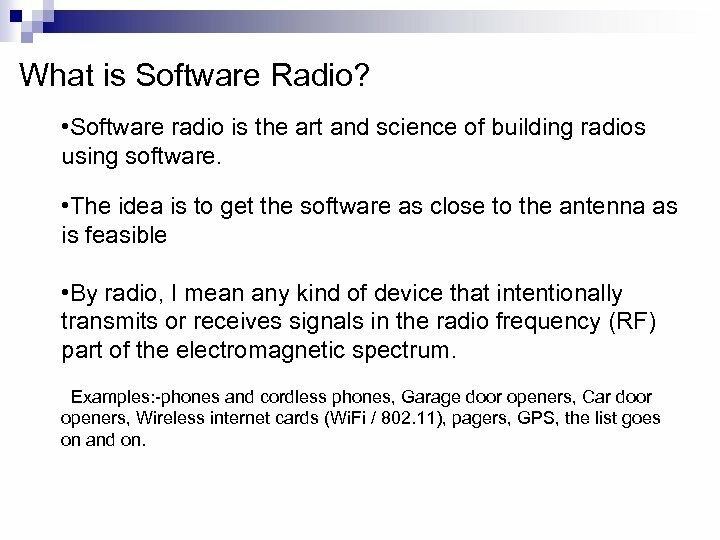 • Software radio is the art and science of building radios using software. 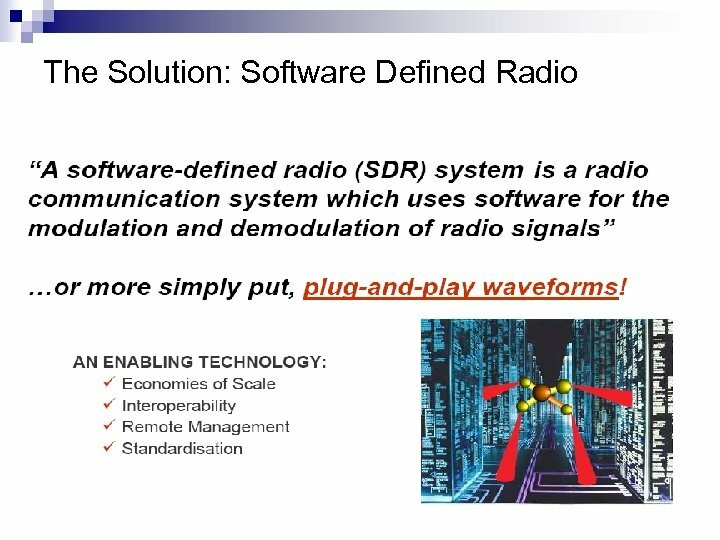 • The idea is to get the software as close to the antenna as is feasible • By radio, I mean any kind of device that intentionally transmits or receives signals in the radio frequency (RF) part of the electromagnetic spectrum. Examples: -phones and cordless phones, Garage door openers, Car door openers, Wireless internet cards (Wi. Fi / 802. 11), pagers, GPS, the list goes on and on. 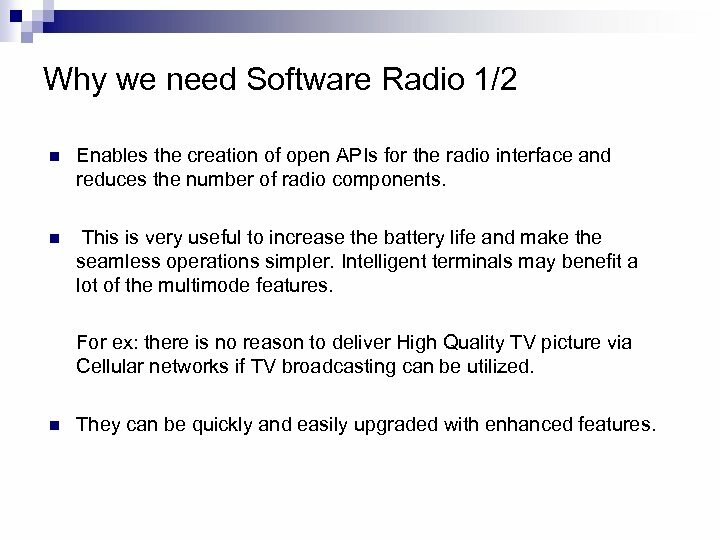 Why we need Software Radio 1/2 n Enables the creation of open APIs for the radio interface and reduces the number of radio components. n This is very useful to increase the battery life and make the seamless operations simpler. Intelligent terminals may benefit a lot of the multimode features. For ex: there is no reason to deliver High Quality TV picture via Cellular networks if TV broadcasting can be utilized. n They can be quickly and easily upgraded with enhanced features. 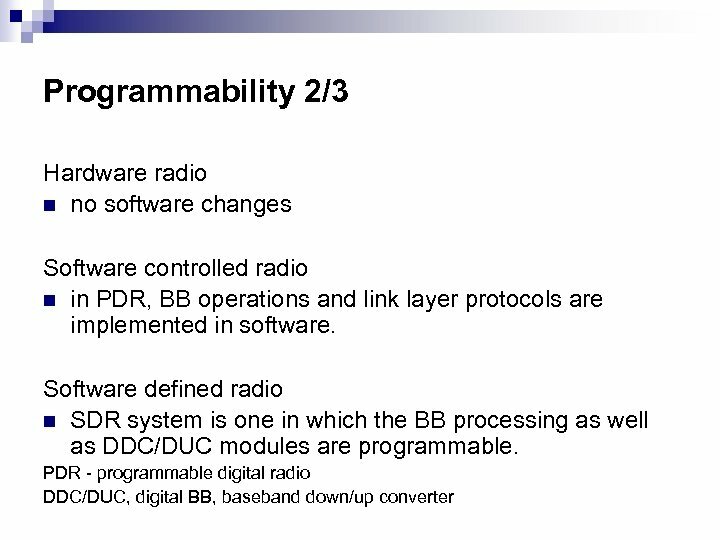 Why we need Software Radio 2/2 n They can be reconfigured "on-the-fly". That is, depending on what you need, your universal communication device would reconfigure itself appropriately for your environment. Example: -It could be a cordless phone minute, a cell phone the next, a wireless internet gadget the next, and a GPS receiver another. 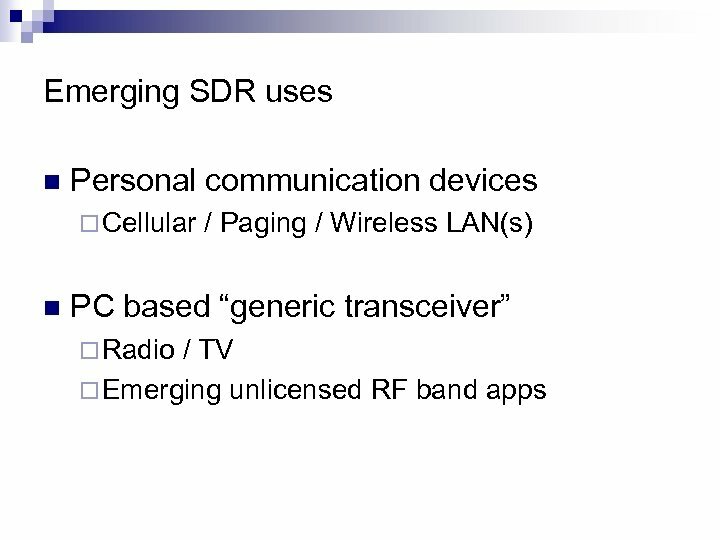 n Smart radios or cognitive radios can look at the utilization of the RF spectrum in their immediate neighborhood, and configure themselves for best performance n Software radio makes it feasible to implement many of the complementary advances in wireless technology that have occurred in recent years, including smart antennas, adaptive power management, or new modulation and signal processing techniques. 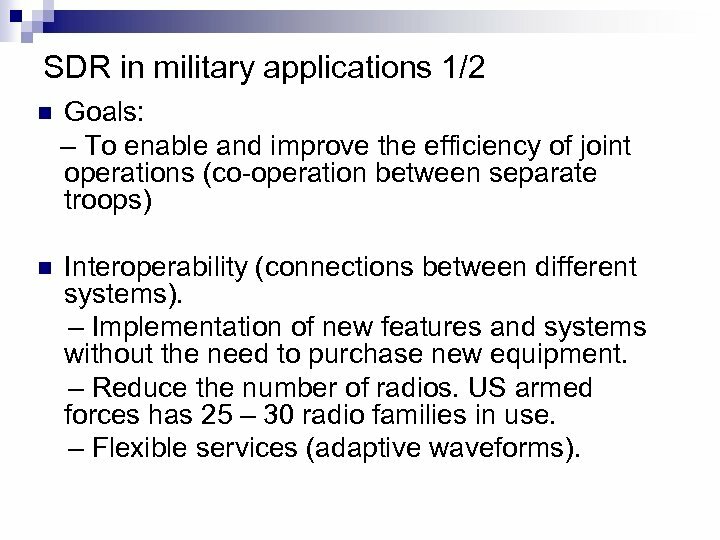 SDR in military applications 1/2 n Goals: – To enable and improve the efficiency of joint operations (co-operation between separate troops) n Interoperability (connections between different systems). – Implementation of new features and systems without the need to purchase new equipment. – Reduce the number of radios. US armed forces has 25 – 30 radio families in use. – Flexible services (adaptive waveforms). 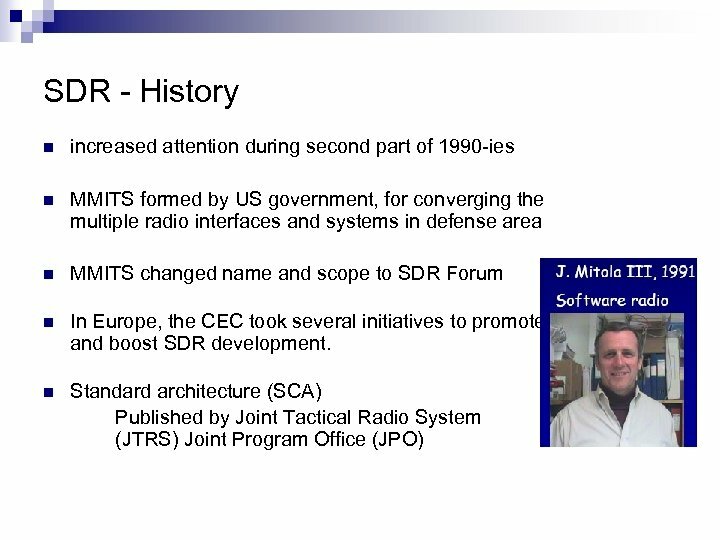 SDR in military applications 2/2 n Joint tactical radio systems – JTRS – US military software radio program. 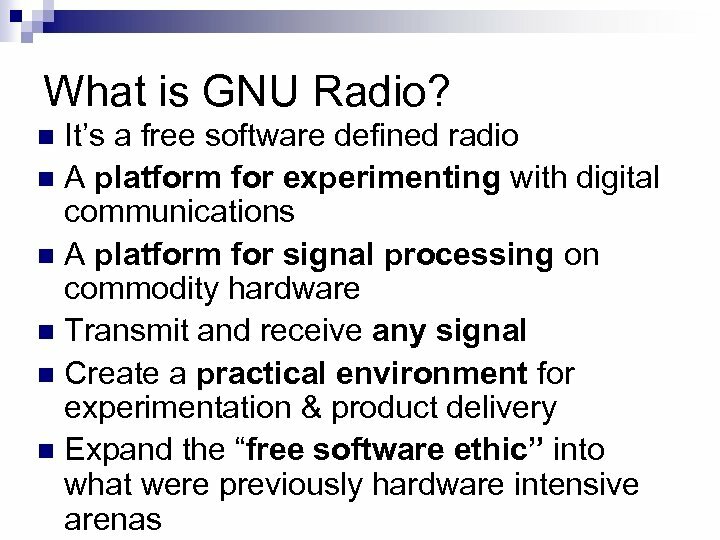 – Family of common Radios and Waveforms built around a standard open architecture. 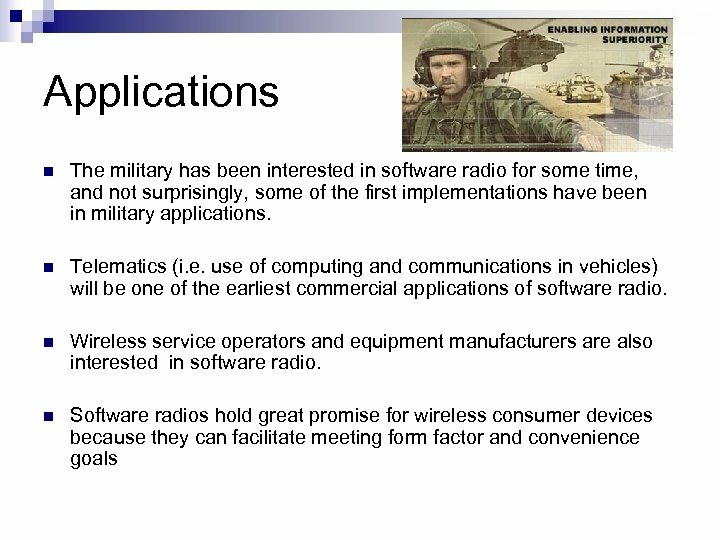 – New radios of US armed forces must fulfill JTRS requirements. 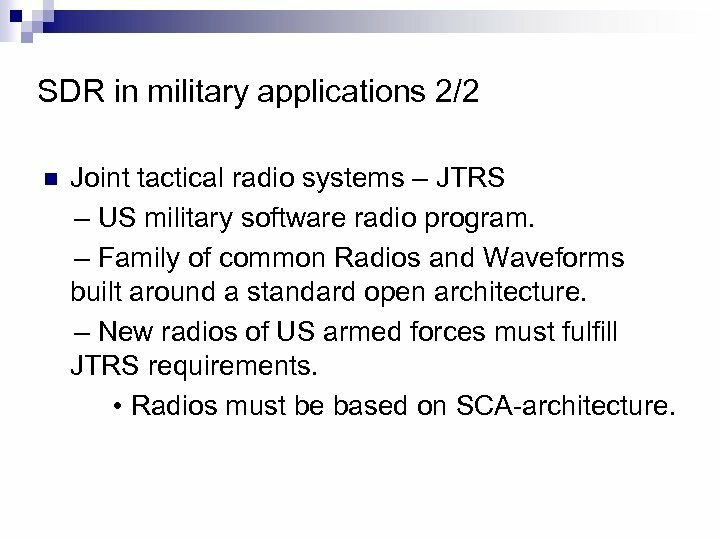 • Radios must be based on SCA-architecture. 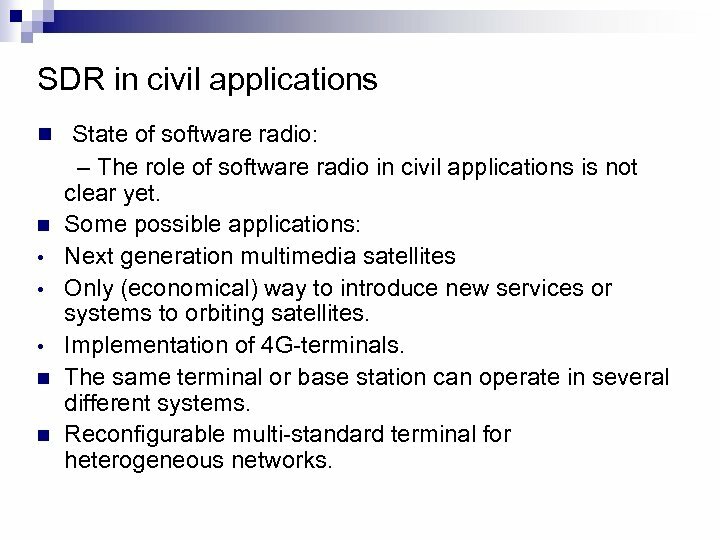 SDR in civil applications n State of software radio: n • • • n n – The role of software radio in civil applications is not clear yet. Some possible applications: Next generation multimedia satellites Only (economical) way to introduce new services or systems to orbiting satellites. Implementation of 4 G-terminals. The same terminal or base station can operate in several different systems. Reconfigurable multi-standard terminal for heterogeneous networks. 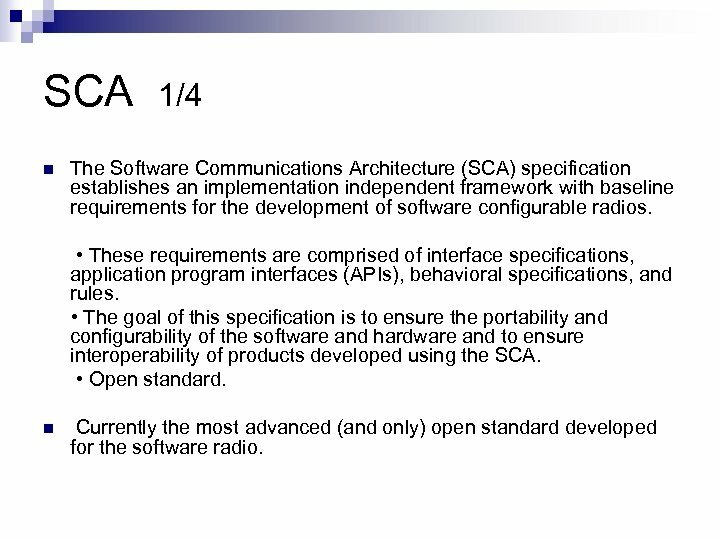 SCA n 1/4 The Software Communications Architecture (SCA) specification establishes an implementation independent framework with baseline requirements for the development of software configurable radios. • These requirements are comprised of interface specifications, application program interfaces (APIs), behavioral specifications, and rules. 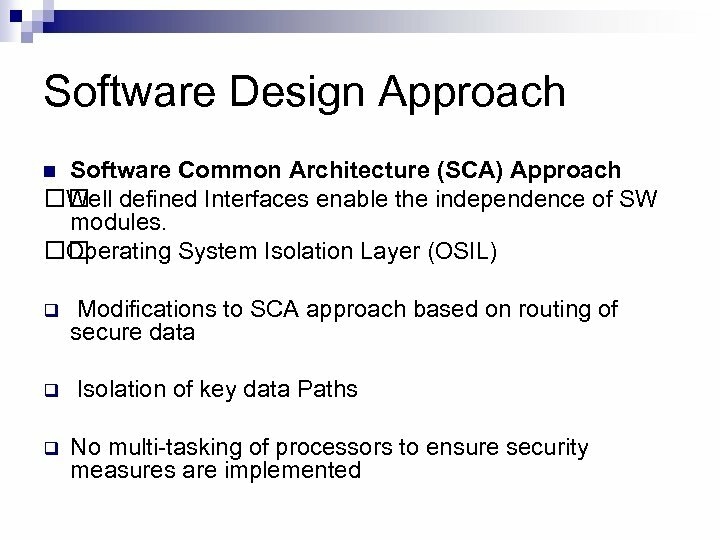 • The goal of this specification is to ensure the portability and configurability of the software and hardware and to ensure interoperability of products developed using the SCA. • Open standard. 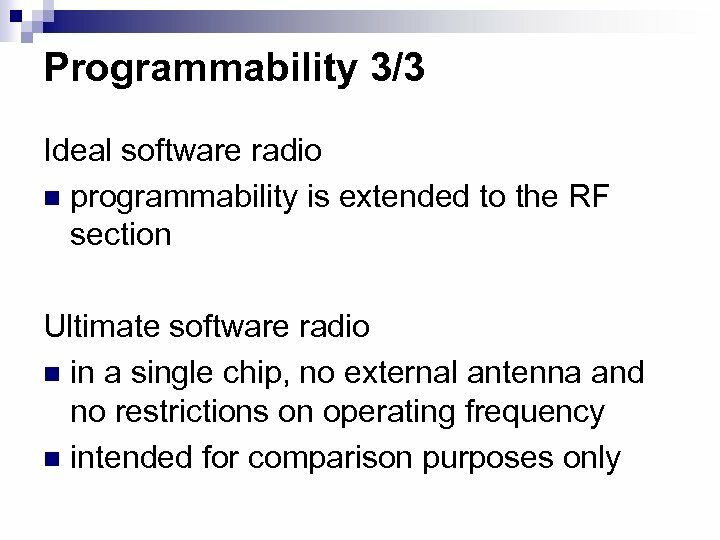 n Currently the most advanced (and only) open standard developed for the software radio. 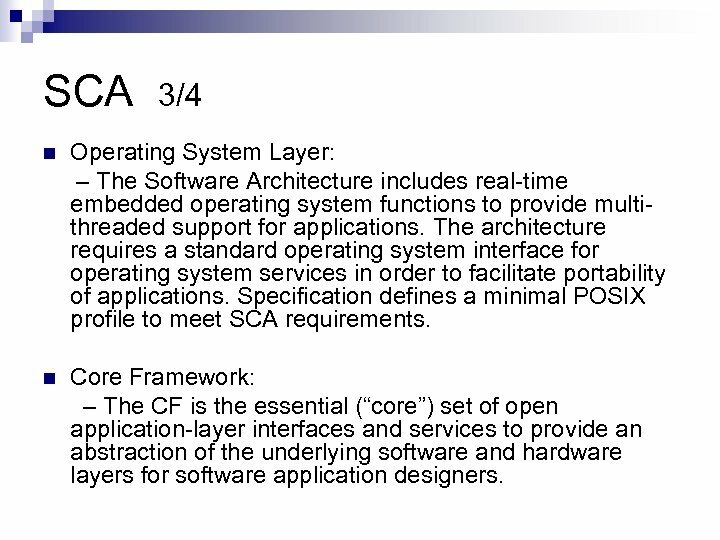 SCA 2/4 n Bus Layer (Board Support Package): – The Software Architecture is capable of operating on commercial bus architectures. Possible buses include VME, PCI, Compact. 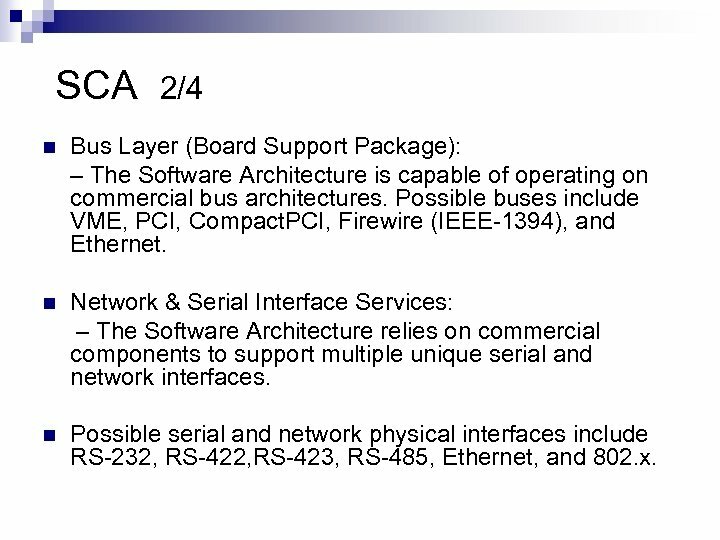 PCI, Firewire (IEEE-1394), and Ethernet. 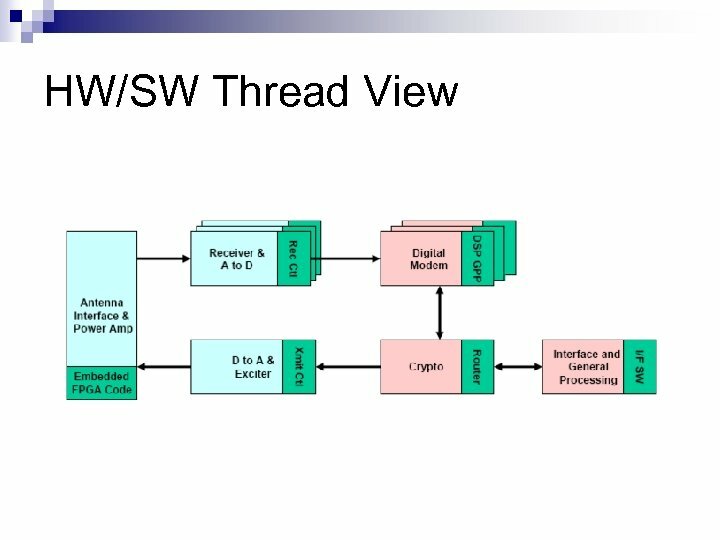 n Network & Serial Interface Services: – The Software Architecture relies on commercial components to support multiple unique serial and network interfaces. 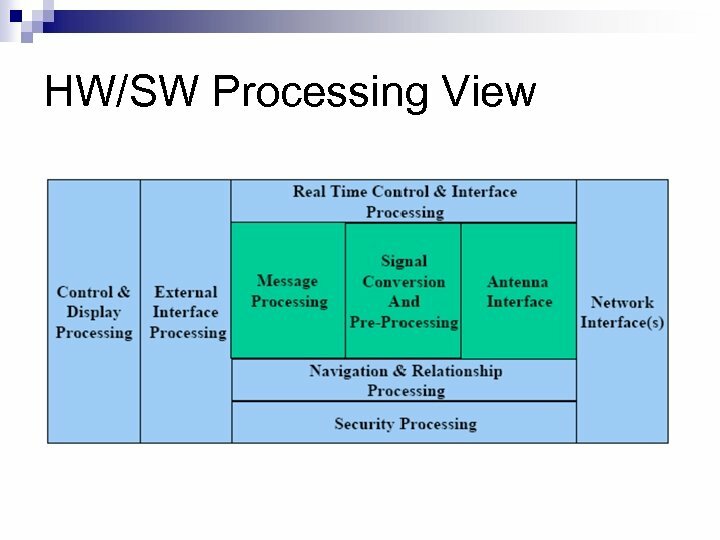 n Possible serial and network physical interfaces include RS-232, RS-423, RS-485, Ethernet, and 802. x.
SCA 3/4 n Operating System Layer: – The Software Architecture includes real-time embedded operating system functions to provide multithreaded support for applications. The architecture requires a standard operating system interface for operating system services in order to facilitate portability of applications. Specification defines a minimal POSIX profile to meet SCA requirements. 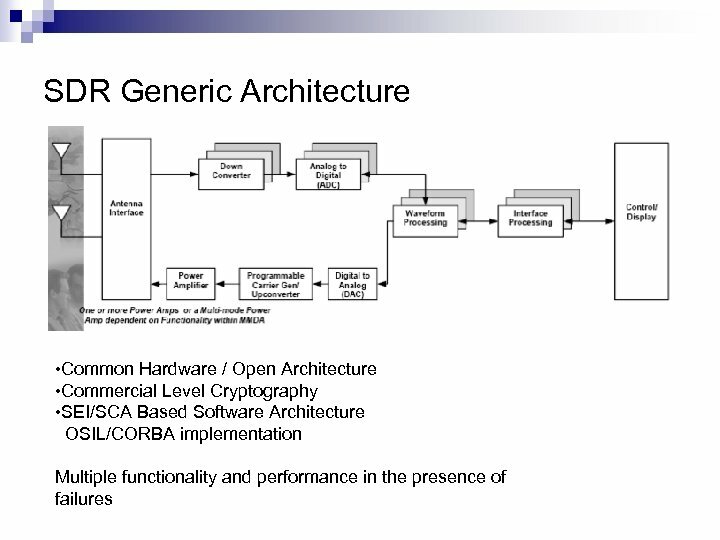 n Core Framework: – The CF is the essential (“core”) set of open application-layer interfaces and services to provide an abstraction of the underlying software and hardware layers for software application designers. 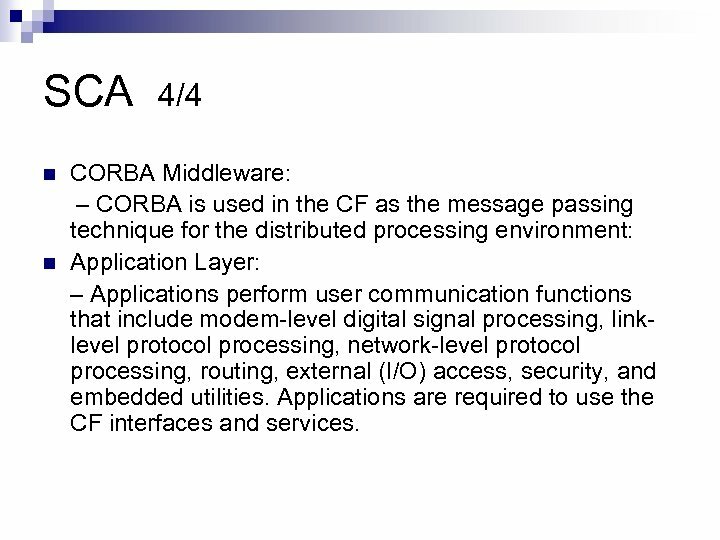 SCA n n 4/4 CORBA Middleware: – CORBA is used in the CF as the message passing technique for the distributed processing environment: Application Layer: – Applications perform user communication functions that include modem-level digital signal processing, linklevel protocol processing, network-level protocol processing, routing, external (I/O) access, security, and embedded utilities. Applications are required to use the CF interfaces and services. 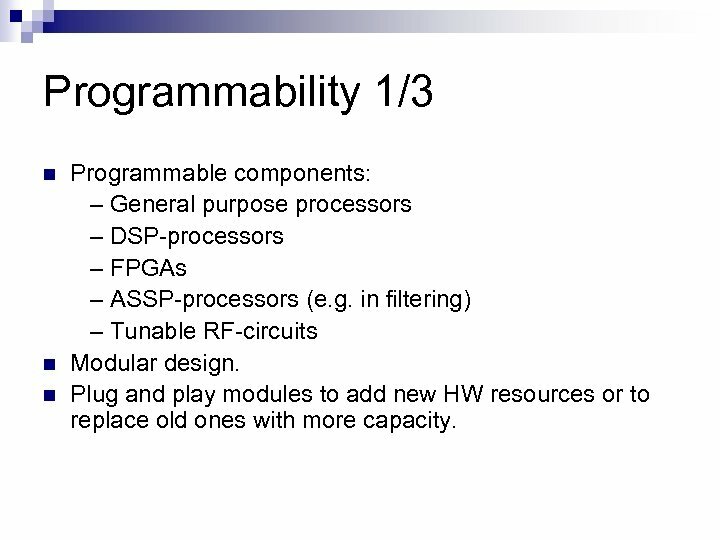 Programmability 1/3 n n n Programmable components: – General purpose processors – DSP-processors – FPGAs – ASSP-processors (e. g. in filtering) – Tunable RF-circuits Modular design. Plug and play modules to add new HW resources or to replace old ones with more capacity. 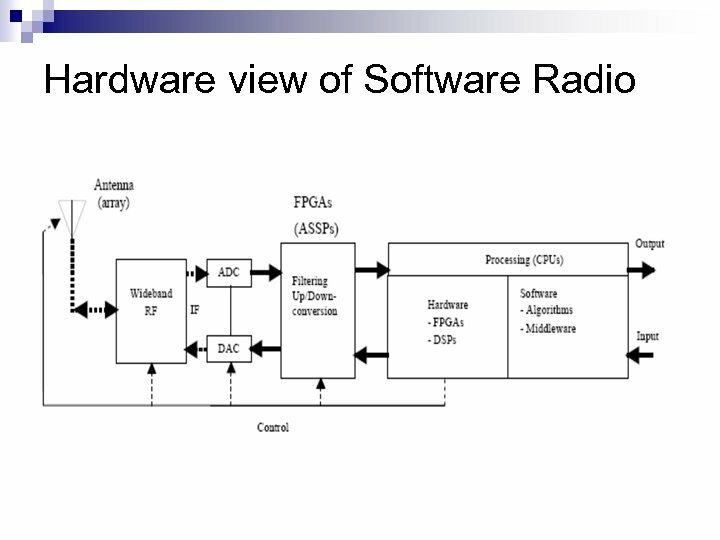 Software Radio Networking n n n Software radios acting as nodes in a network. 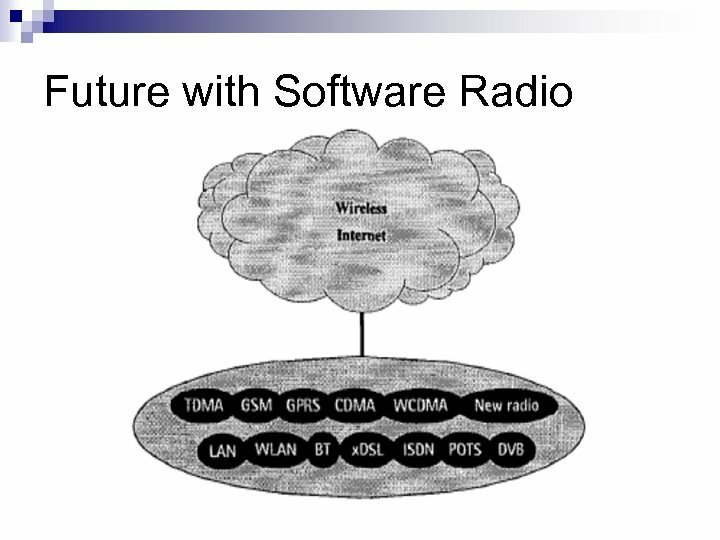 Software radios acting as gateways or bridges between networks. 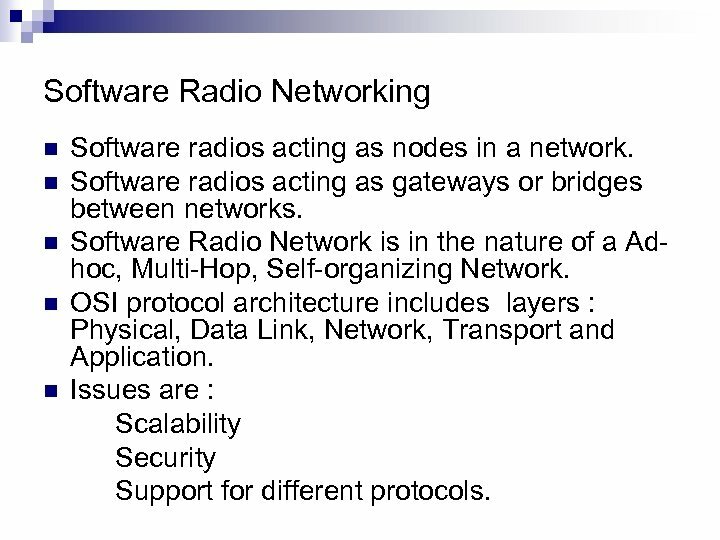 Software Radio Network is in the nature of a Adhoc, Multi-Hop, Self-organizing Network. 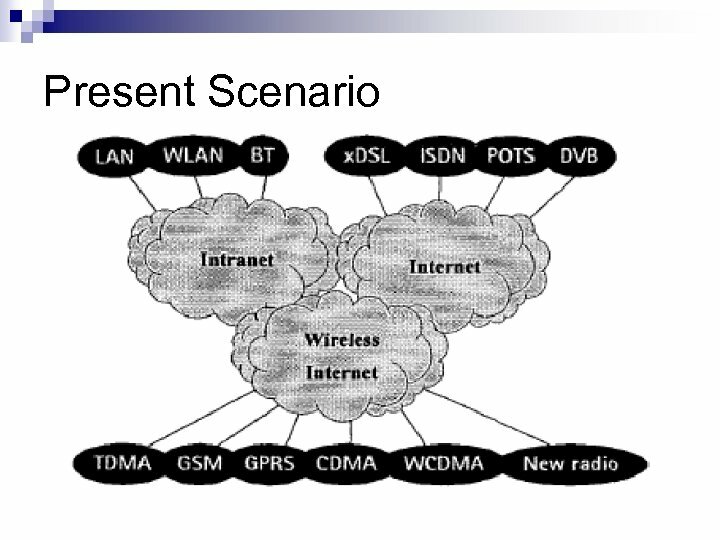 OSI protocol architecture includes layers : Physical, Data Link, Network, Transport and Application. 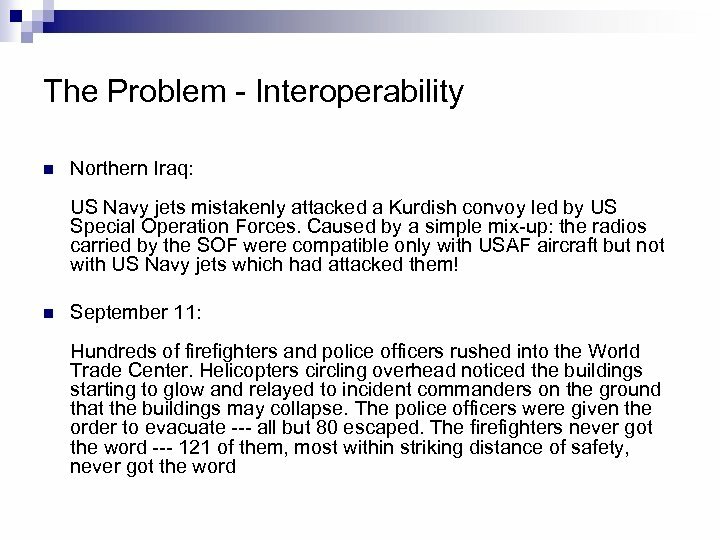 Issues are : Scalability Security Support for different protocols. Technological challenges 1/3 n Data converters are one of the key enabling technologies. 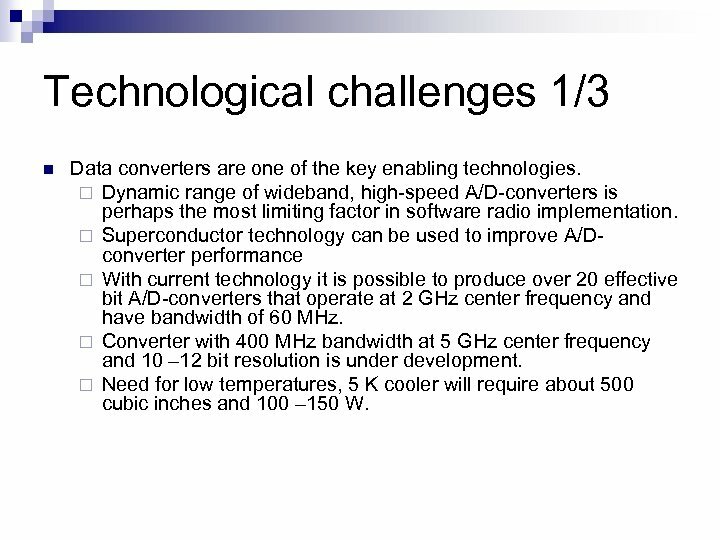 ¨ Dynamic range of wideband, high-speed A/D-converters is perhaps the most limiting factor in software radio implementation. ¨ Superconductor technology can be used to improve A/Dconverter performance ¨ With current technology it is possible to produce over 20 effective bit A/D-converters that operate at 2 GHz center frequency and have bandwidth of 60 MHz. ¨ Converter with 400 MHz bandwidth at 5 GHz center frequency and 10 – 12 bit resolution is under development. ¨ Need for low temperatures, 5 K cooler will require about 500 cubic inches and 100 – 150 W.
Technological challenges 2/3 n In portable devices power consumption is a critical issue. ¨ Fast data converters and powerful (high clock frequency) processors need more power than slower ones. ¨ Applications (e. g. image processing) need processing capacity. ¨ A/D-processing at low IF-frequency or at base band. ¨ Analog down conversion and filtering. 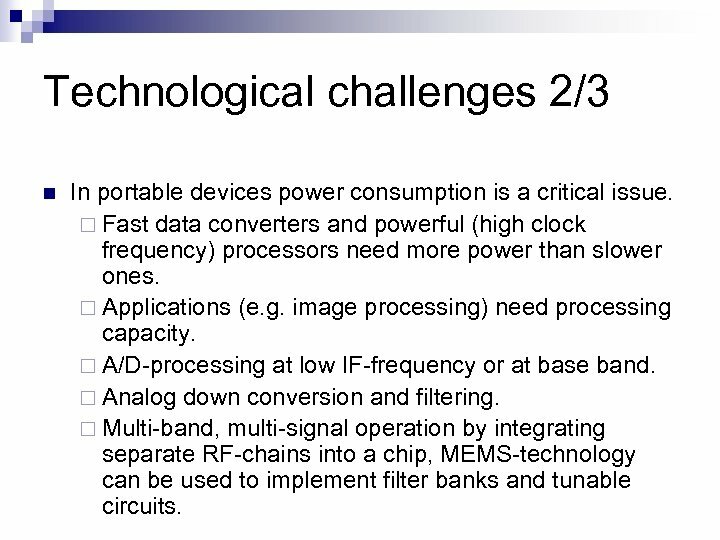 ¨ Multi-band, multi-signal operation by integrating separate RF-chains into a chip, MEMS-technology can be used to implement filter banks and tunable circuits. 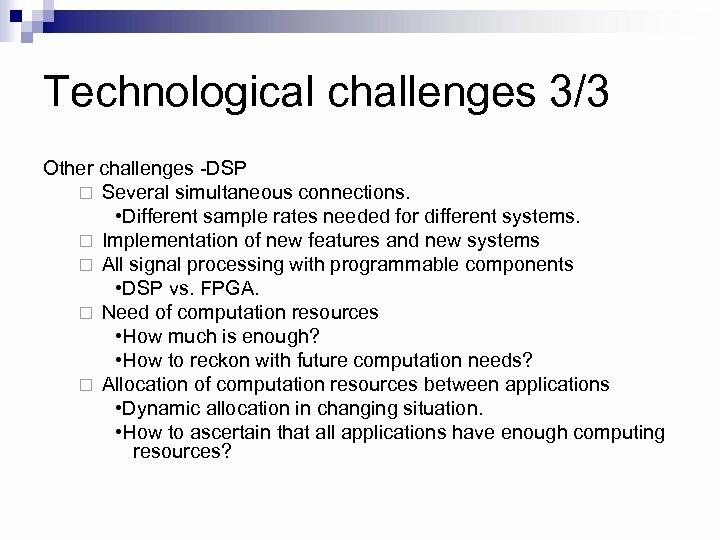 Technological challenges 3/3 Other challenges -DSP ¨ Several simultaneous connections. • Different sample rates needed for different systems. ¨ Implementation of new features and new systems ¨ All signal processing with programmable components • DSP vs. FPGA. ¨ Need of computation resources • How much is enough? • How to reckon with future computation needs? ¨ Allocation of computation resources between applications • Dynamic allocation in changing situation. • How to ascertain that all applications have enough computing resources? 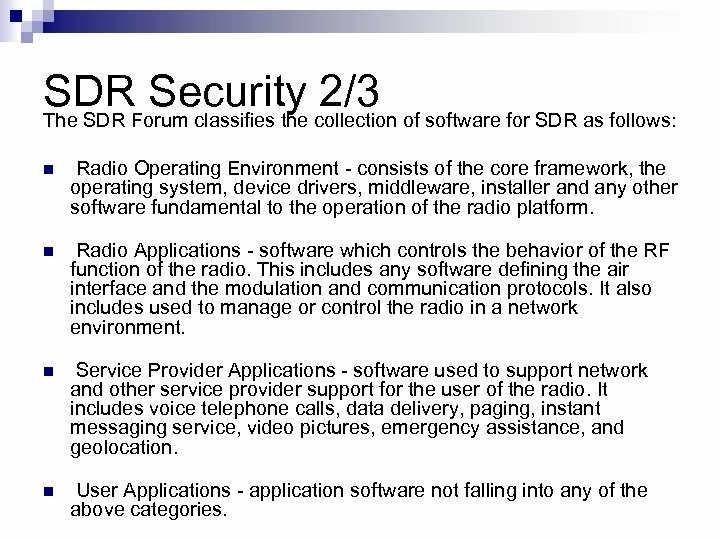 SDRForum classifies the collection of software for SDR as follows: Security 2/3 The SDR n Radio Operating Environment - consists of the core framework, the operating system, device drivers, middleware, installer and any other software fundamental to the operation of the radio platform. 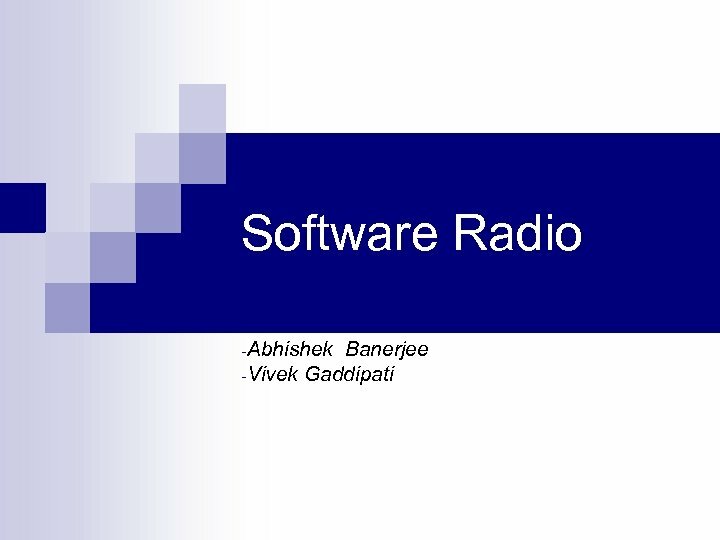 n Radio Applications - software which controls the behavior of the RF function of the radio. This includes any software defining the air interface and the modulation and communication protocols. It also includes used to manage or control the radio in a network environment. 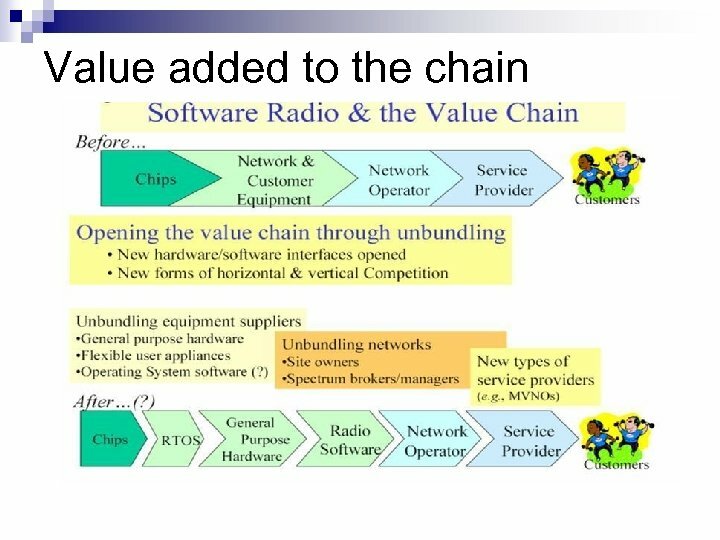 n Service Provider Applications - software used to support network and other service provider support for the user of the radio. It includes voice telephone calls, data delivery, paging, instant messaging service, video pictures, emergency assistance, and geolocation. 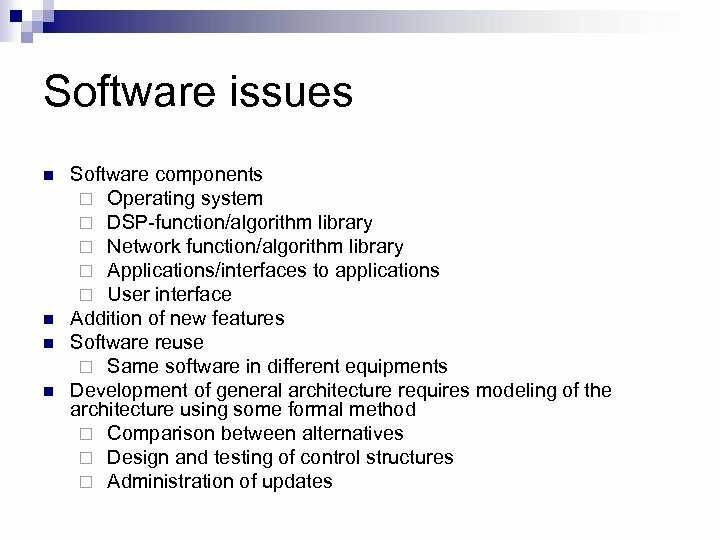 n User Applications - application software not falling into any of the above categories. 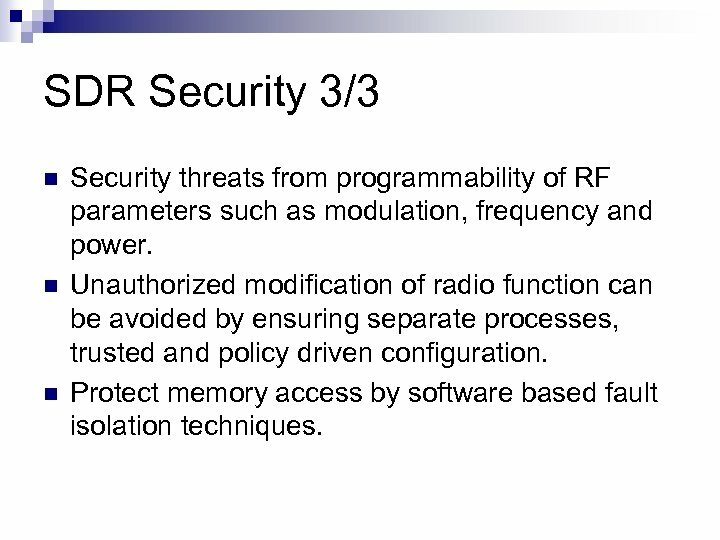 SDR Security 3/3 n n n Security threats from programmability of RF parameters such as modulation, frequency and power. 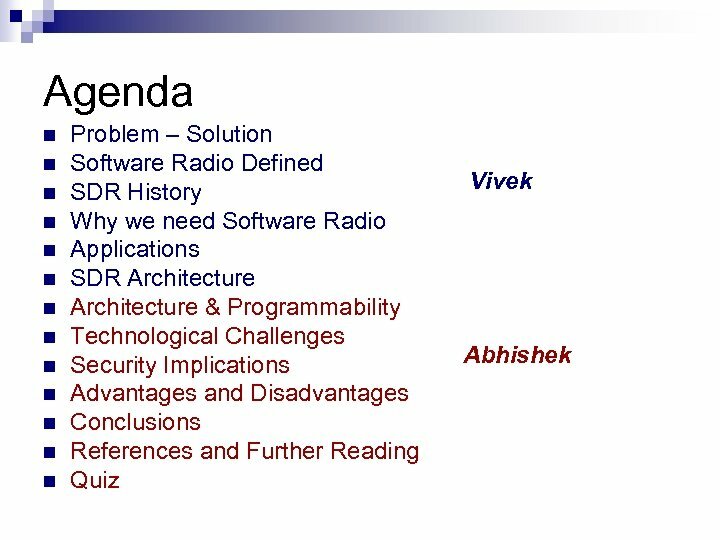 Unauthorized modification of radio function can be avoided by ensuring separate processes, trusted and policy driven configuration. Protect memory access by software based fault isolation techniques. 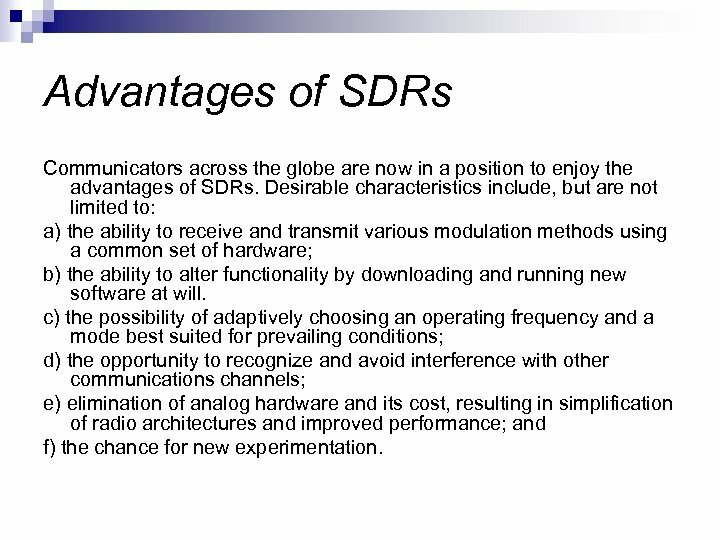 Advantages of SDRs Communicators across the globe are now in a position to enjoy the advantages of SDRs. Desirable characteristics include, but are not limited to: a) the ability to receive and transmit various modulation methods using a common set of hardware; b) the ability to alter functionality by downloading and running new software at will. c) the possibility of adaptively choosing an operating frequency and a mode best suited for prevailing conditions; d) the opportunity to recognize and avoid interference with other communications channels; e) elimination of analog hardware and its cost, resulting in simplification of radio architectures and improved performance; and f) the chance for new experimentation. 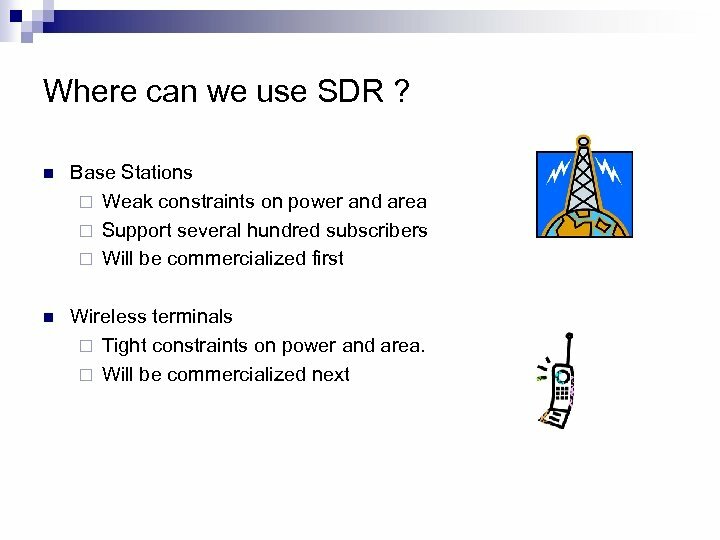 Disadvantages of SDRs While SDRs offer benefits as outlined above, a few obstacles remain to their universal acceptance. 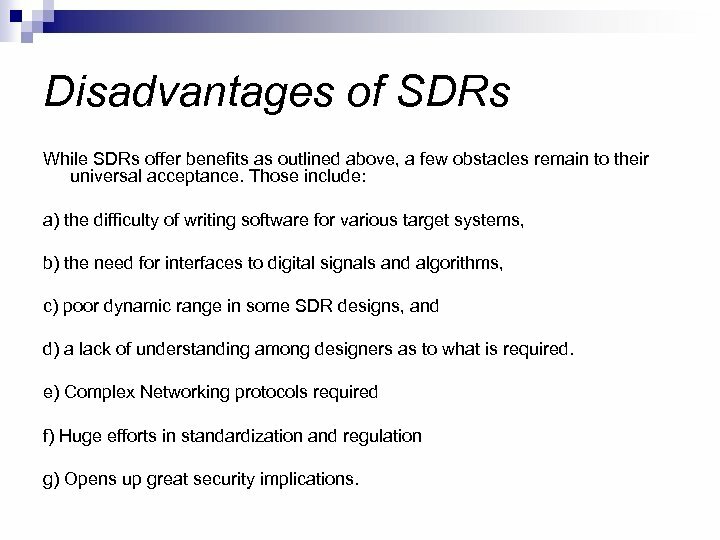 Those include: a) the difficulty of writing software for various target systems, b) the need for interfaces to digital signals and algorithms, c) poor dynamic range in some SDR designs, and d) a lack of understanding among designers as to what is required. 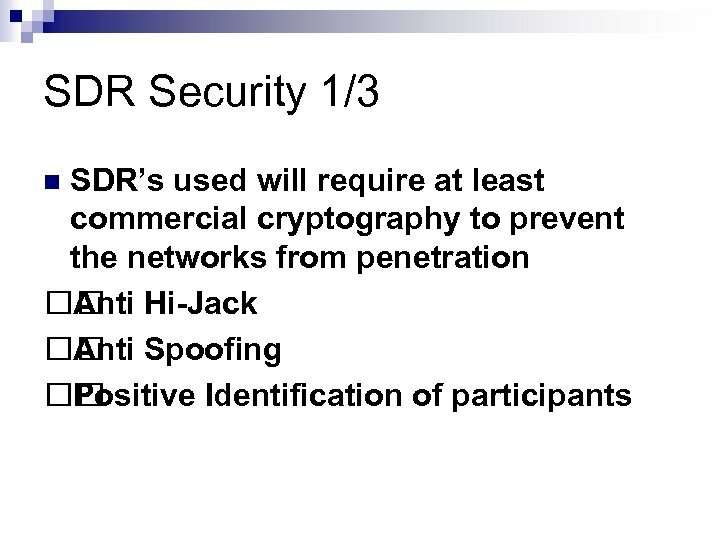 e) Complex Networking protocols required f) Huge efforts in standardization and regulation g) Opens up great security implications. References & Further Reading n n n n www. 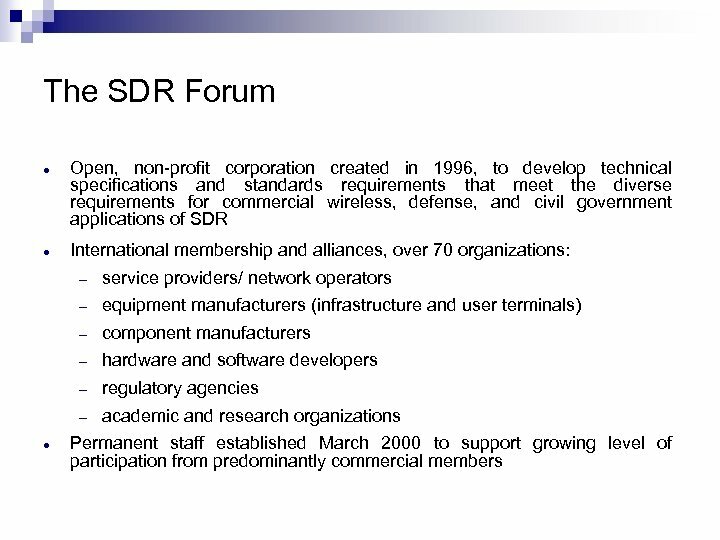 sdrforum. 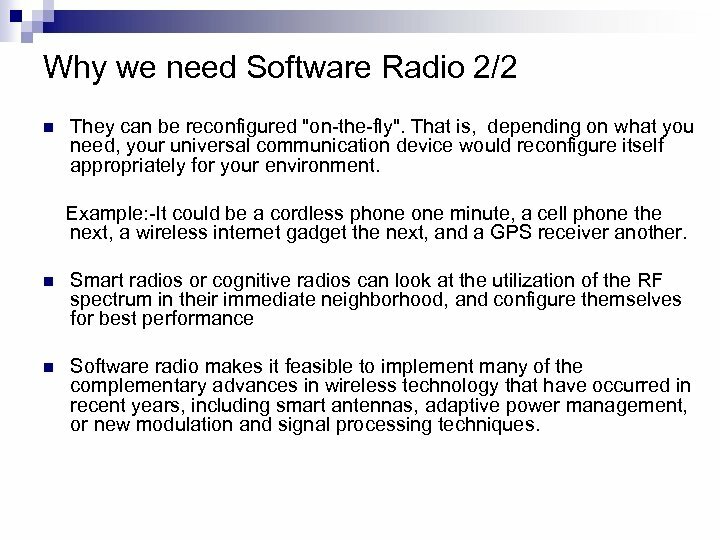 org Reed J. H. , Software Radio: A Modern Approach to Radio Engineering, Prentice Hall, 2002 Tuttlebee W. (Ed. 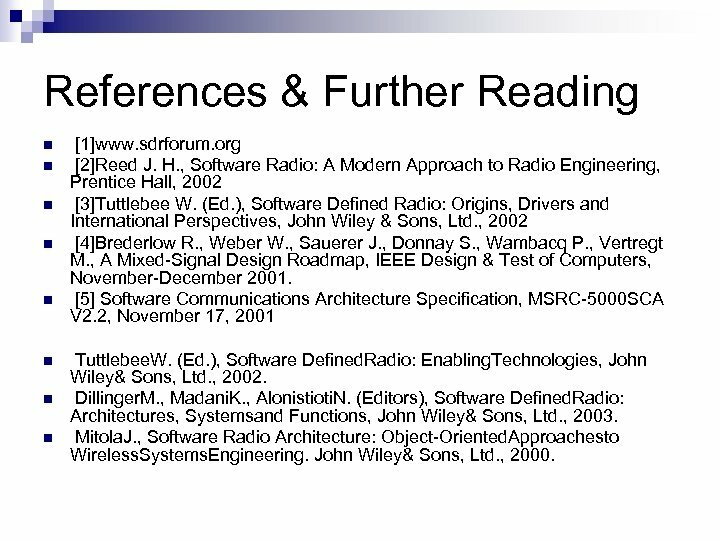 ), Software Defined Radio: Origins, Drivers and International Perspectives, John Wiley & Sons, Ltd. , 2002 Brederlow R. , Weber W. , Sauerer J. , Donnay S. , Wambacq P. , Vertregt M. , A Mixed-Signal Design Roadmap, IEEE Design & Test of Computers, November-December 2001. 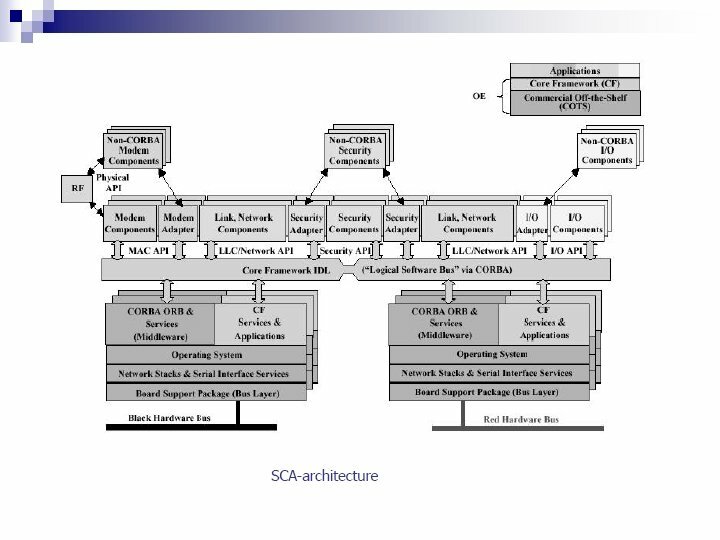 Software Communications Architecture Specification, MSRC-5000 SCA V 2. 2, November 17, 2001 Tuttlebee. W. (Ed. ), Software Defined. Radio: Enabling. Technologies, John Wiley& Sons, Ltd. , 2002. Dillinger. M. , Madani. K. , Alonistioti. N. (Editors), Software Defined. Radio: Architectures, Systemsand Functions, John Wiley& Sons, Ltd. , 2003. Mitola. 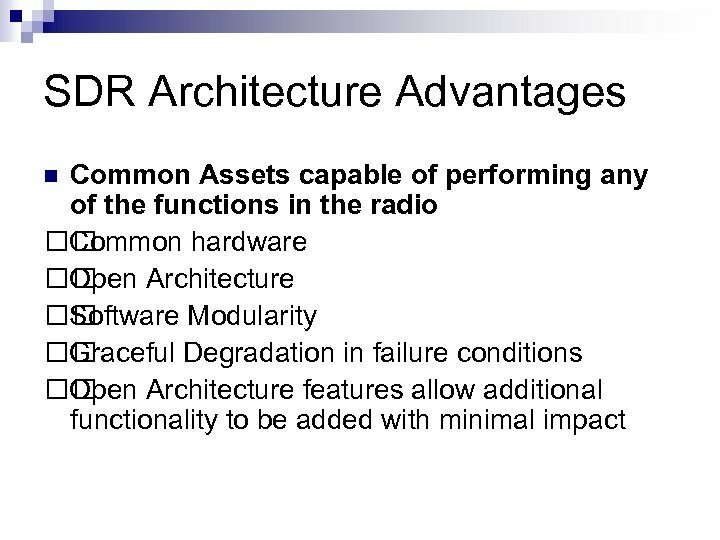 J. , Software Radio Architecture: Object-Oriented. Approachesto Wireless. Systems. Engineering. John Wiley& Sons, Ltd. , 2000.